Can record “markers” throughout the trip for specific incidents. Can use on fleet and private vehicles. Utilising GPS and Google Map tracking technology, the transport module can be used for both fleet and private vehicle use alike. 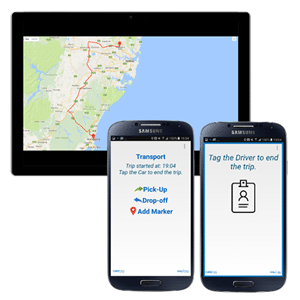 With a simple tap-on/tap-off, it records pick up and drop off times and GPS locations, length of trip including distance travelled and time taken to complete the trip including a full route map of the trip, it also provides a facility for recording “markers” throughout the trip for specific incidents. Utilising the smart card technology, the system separates staff and individual client details for accurate payroll, mileage and billing purposes.